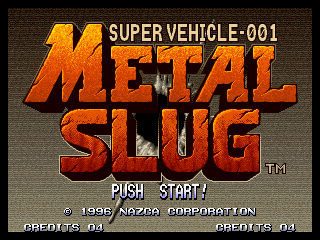 Super Vehicle-001: Metal Slug (メタルスラッグ, Metaru Suraggu), more commonly known as simply Metal Slug, is a run and gun video game developed and originally released by Nazca Corporation and later published by SNK. It was originally released in 1996 for the Neo Geo MVS arcade platform. The game is widely known for its sense of humor, fluid hand-drawn animation, and fast paced two-player action. It is the first title in the Metal Slug series. It has been ported to the Neo Geo AES, Neo Geo CD, Sega Saturn, PlayStation, Virtual Console, PlayStation Network, iOS, Android and Neo Geo X, and to the Wii, PlayStation Portable and PlayStation 2 (as part of the Metal Slug Anthology).